6waves’ Fruit Jamba is off to a fast start on Facebook, as the new puzzle game has climbed to over 228,000 monthly active users (MAU) in just a few weeks. According to our tracking service AppData, the game had just 6,300 players on March 29. 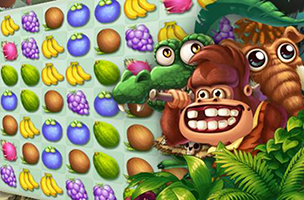 In Fruit Jamba, players complete match-three levels by collecting fruit and completing level-specific tasks. Each level in Fruit Jamba has a different goal and board layout, along with a limited number of moves to complete those requirements. For instance, one may ask players to collect 48 coconuts, while another requires any kind of fruit, but in a very large quantity. As players progress, they’ll gain access to animal friends and their power-ups. A tiger, for instance, gives players a boomerang that clears a 3×3 square of symbols from the board, while a mammoth doubles the value of fruits. However, these boosters are only added to the board after players complete specific matches with the animals’ favorite fruits. Other power-ups are available to purchase before or during each level, and include additional move packs and picks, which can be used to clear any single fruit from the board. The more moves remaining at the end of the stage, the more points players’ earn, and the more stars they unlock for that level. Gamers can replay stages to increase their high scores or earn missed stars, and can compare their progress with their Facebook friends on each individual level. Fruit Jamba is now available to play for free on Facebook. Check back soon to follow the game on AppData, our tracking platform for mobile and social apps and developers.